When a person is attacked or injured on private property the experience can be frightening, painful and outright devastating. It only becomes worse when investigation reveals that the property owner knew or should have known of the potential for danger and did nothing to prevent it. Each year in America, an untold number of people are hurt while on someone else's property. 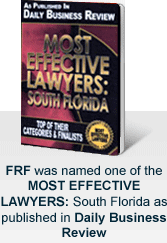 At Friedman, Rodman & Frank, P.A., we help injured individuals to achieve the best possible results in Florida courts. At our law firm, we have the experience, knowledge and resources necessary to successfully represent clients in premises liability cases. Can I Afford the Cost of a Lawyer? All cases we accept are on a contingency fee basis. Simply put: this means we do not get paid unless we are successful, that is, a recovery is made, whether through negotiations or ultimately through a jury verdict. You do not pay any advance fee or costs. Because of our many years of success and accumulated experience we have the strength to often commit large amounts of resources to properly prepare your case to obtain the maximum recovery. This would include but not be limited to the costs for thorough investigation, and to retain expert witnesses who are respected leaders in their fields. You do not have to reimburse any costs we have advanced in your case unless we are successful-if we win your case. Because of our long history of success as a firm and as litigators in serious injury cases we have the power less successful firms may not have to underwrite the substantial expenses that will be incurred in potentially large cases. This ability and power provides you, the client, with the assurance that we can take fight your case to the end which gives us a definite advantage in bringing about a successful recovery on your claim. In inadequate security cases, our main objective is to help you achieve the best result possible. Sometimes we will counsel our client to reject an attractive but ultimately insufficient offer from an insurance company, if we believe further negotiations or litigation will yield a better offer. In negligent security cases, we will look for all possible claims, like the owner of a hotel chain that failed to act on a security problem or the manufacturer of security cameras who knew they were defective. We strive to provide you with the best possible representation at every stage of your case. Our personal injury attorneys take the time to answer your questions and involve you closely in the legal process. We will visit you at home or in the hospital to confirm that you understand your legal options, so that we are always working to achieve your personal goals. To discuss your options with an experienced lawyer, call us at 305-448-8585 or toll free at 877-448-8585 or contact us online. Consultations are free and confidential.